State-owned Anglo Irish Bank has announced a €8.2 billion loss for the first six months of 2010. This is well in excess of the previous six-month deficit of €4.1 billion posted last year and means Anglo has set a new Irish corporate record for a loss in a six-month period. …and how much more are we going to pay? Ratings agency Standard & Poor’s estimated last week that the cost of Anglo to the State could rise to €35 billion over time. Let’s just recall by way of comparison that after the monies removed last year, and this, we can anticipate according to the Stability Programme €3bn in expenditure cuts in 2011 and a further €3bn in 2012 and… well let’s not even think of 20013. FAMILIES will soon be paying more than €500 a year in ‘green taxes’, new figures compiled by the Irish Independent reveal. And in a double blow, consumers already facing a 5pc hike in electricity charges due to an environmental levy could be hit by a second price rise as early as next month. Some would note the discrepancy between the headline and the sentence that follows it… but… this would be made up how? •	The new electricity levy of €32.76 a year for a household. •	At least €175 for domestic water charges. •	Up to €275 a year in carbon taxes on petrol and diesel. •	As much as €55 a year for carbon taxes on home heating oil. Last December the first tranche of the carbon tax was introduced in the Budget which saw motorists hit with a hike in fuel prices as petrol rose by four cents per litre and diesel by five cents. It has been estimated that people living in the countryside could face bills of up to €275 a year. In May the price of kerosene home heating oil rose by 8.4pc, meaning a typical 1,000 litre delivery of kerosene rose from €620 to €670. There has also been speculation that flat-rate domestic water charges could be introduced in the next Budget in December when the Government will slash another €3bn in spending, despite previous promises to first install a system of metering. The Department of Finance has already mooted a water charge of €175 per home per year. The green charges don’t end there. Since February, landfill levies have risen by €5 to €30 per tonne of waste being disposed of at dumps. There is little doubt that this will filter into household bin charges eventually. Interestingly the Irish Taxation Institute has a link to the original article on its site with no explanation. As it happens the media themselves indicate that the introduction of water charges is highly unlikely any time soon, not least because there’s no metering system in place. A flat rate services charge has been mooted, but this seems equally unlikely because the government will have enough problems to contend with at the next budget and they’ve already dismissed the idea of a flat rate water charge as unfair. Now, this is not to say that some of these may manifest themselves and sooner rather than later, but… As it now stands they simply don’t exist in the form presented in the Independent and to pretend otherwise is absurd. Indeed it diverts attention from the things that the government has actually done. During the week myself and a friend were, as one does, going through the constituencies and doing a rough tot up of seats FF is likely to lose. From a current base of the mid-70s (assuming most of the semi-detached FF TDs jump back aboard, and there’s little indication that they’re planning to go it alone, we worked out a rough estimate of about 20 to 25 seats lost. I’ve talked to AK at the Irish Election Literature Blog and he thinks that this is on the low side and it would be a fair bit more, although that comes with the caveat of who is leader. I’ll say no more on that since I know AK will be discussing these matters in greater detail over the next while. In any event while catastrophic for Fianna Fáil it still leaves two opposition parties (in particular) searching to make gains. 30 + seats distributed between Labour and FG – clearly some will go elsewhere, but those are the big guns so to speak – doesn’t push Labour much over 30 odd, or FG much over 65. Good results, again no doubt about it, but they’ll want – and need – more, and some more than others as they attempt to maximise their influence at Cabinet. Where to find that extra ten or so seats that might confer on either party the gains they require? Well, there’s SF, but SF may be okayish, may even pick up the odd one or two. The former PDs? Noel Grealish might just hold on, having badged himself Independent at a reasonably propitious point in the last three years. And that leaves a couple of Independents and the Green Party. Now few would argue that the GP is in the first flush of rude good electoral health. They’ll be lucky to get two or three TDs returned. Very lucky. But, that’s two or three TDs denied to the opposition. Even if FF losses are greater – say due to incumbents retiring, it doesn’t matter. The opposition can’t count on that taking place, so they will focus their fire on whatever targets will gift them increased seats. Small wonder then if we begin to hear a media chorus about the GP, because some will not merely want to see the political corpse buried but with a stake or two through the heart. And this works other ways as well. FF must be aware of this as well, profoundly so – so who knows whether they too are happy to stir the pot as well. 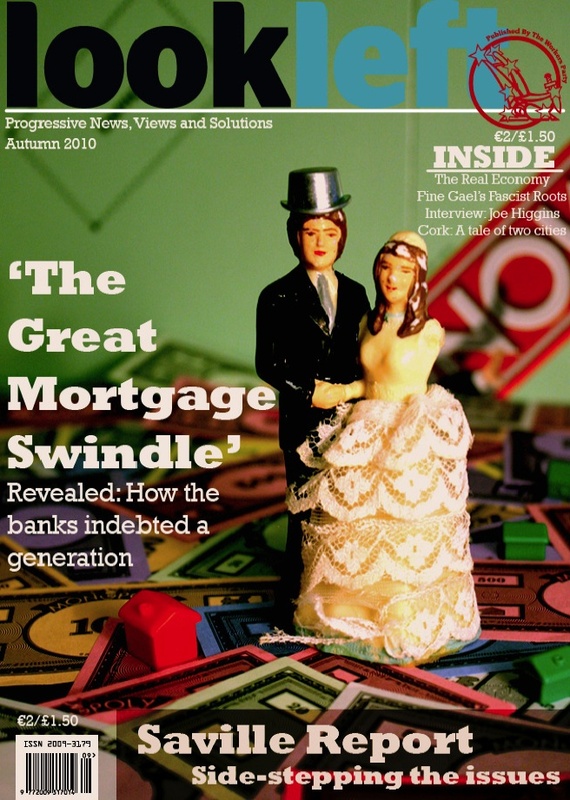 Tough on their current partners if they lose out in various election races here and there (and this might explain the sudden change of heart – more or less – of the GP over Anglo-Irish Bank – a sort of warning shot as it were across the bows of their partners). And that chorus won’t just be about the GP, expect further left, SF and Independents to be down-rated – as it were – in the nearish future as they too are pushed aside. There’s going to be a lot of guff talked about ‘wasted’ votes soon enough. I’ve mentioned before how the discourse had been that public expenditure (and on occasion the public sector itself) was being trumpeted as the economic problem we faced and all else, including NAMA and the bank recapitalisations were secondary issues. While dismissing the recent estimate of ratings agency Standard Poor’s that the cost of Anglo could be €35 billion – €10 billion higher than the Government’s current estimate – Mr Boyle accepted that the final burden was unclear. “We are talking about how long is a piece of string, or how deep is a hole? The Government policy was never going to be open-ended,” he said. Mr Boyle said the matter was likely to be discussed by Cabinet on Wednesday, as the bank was the “biggest draw on public resources”. And so the GP has changed it’s mind. 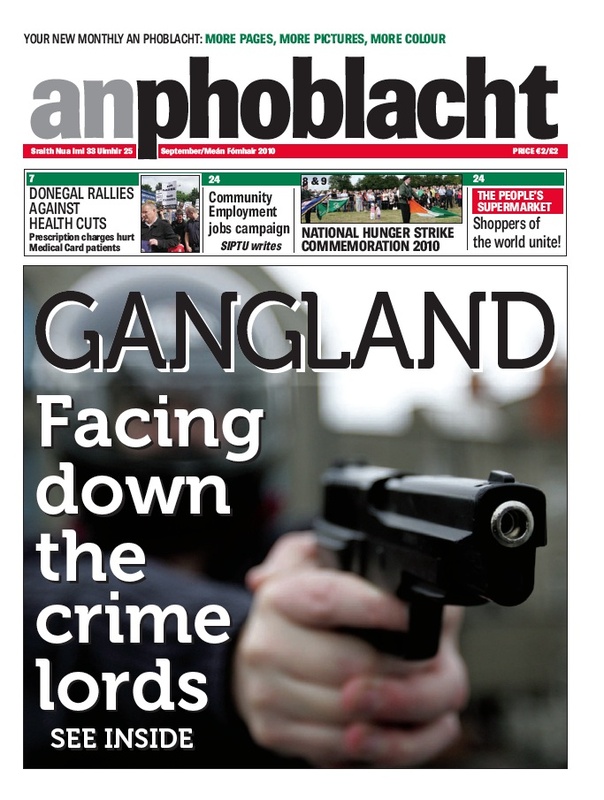 They’re agin a lengthy ‘orderly’ wind down of Anglo-Irish Bank and now want it wound down much quicker. Not too quickly according to the comments, which leaves the issue a little moot – no – given that an election in 18 months or sooner is likely to see the responsibility shifting to others. The Greens’ change of policy comes as the bank prepares to report further substantial losses tomorrow – when Anglo publishes accounts for the first half of the year – and the need for further capital on top of the €14.3 billion already pledged to the bank. And when you set them against the amounts being cut from public expenditure as a means of reducing the deficit (€3bn to be taken out in this years Budget alone) they demonstrate that without them there could have been – and I position this in the context of the orthodox arguments which I for the most part don’t share – a much more gentle approach (including stimulus) to matters financial. Pain? Well even in the orthodox approach had Anglo-Irish not been an issue it could have been significantly diminished. And for all Dan Boyle’s caution, that final burden still seems unclear. Anglo had to take a writedown of €5.1 billion on €9.25 billion of loans, representing a discount of 55 per cent, sold in its first loan transfers to the National Asset Management Agency (Nama) in May. The bank took a further write-down of €4.2 billion this month on €6.75 billion of loans sold in the second tranche of loan transfers to the State agency, representing a higher discount of 62 per cent. The lower value assigned to Nama loans raised fears that the cost of Anglo could rise further. On the other hand cynics might wonder is this a repositioning of the GP ship prior to ultimate departure – the calculation being that the issue that locked them into this government was acquiescence on NAMA (at least that was for many outside the last straw) so they might as well break on it – or a related matter – too. And yet, I’m a bit dubious. The economic mood music isn’t improving, if anything it’s getting worse so there’s no reward for them doing this – one way or another. And there’s the small issue of legacy, what to show for the years in government. It’s not as if there have been no achievements. But whether there are sufficient is quite another matter. “By doing it they way they’re doing it, they’re adding a political instability to the financial instability and if it’s not concluded quickly they’ll make matters worse rather than better,” he added. Shares in Ireland’s largest banks opened lower in Dublin this morning although AIB bounced back in afternoon trading. By 3.15 pm, shares in AIB were up 8 cent at €0.78 while Bank of Ireland was down 3 cent at €0.74. Shares in Irish Life and Permanent, which is not covered by Nama, were down almost 2 per cent at €1.42. Just a reminder of who the real masters are… though frankly they seem as confused as everyone else. Posted by WorldbyStorm in Irish Left Online Document Archive, Socialist Party. Many thanks to Budapestkick for forwarding this document to the Archive. He raises the interesting point that it would be well worth while comparing and contrasting it with other 1798 commemorative documents from other formations. If people have any and are willing to forward them onto the Archive – using the contact email on the right hand column of this site – that would be very helpful. This is the first document from the Socialist Party added to the Archive, which demonstrates a hitherto considerable gap in the collection. We hope to remedy that in the weeks and months that follow – although we do have a reasonable quantity of Militant material already online here. We are producing this pamphlet in order to make available to the left wing public some of the findings of more recent historical research as well as our own analysis of the importance of the revolutionary events of the 1790s for the workers’ movement today. The aim is not to produce a comprehensive history but rather to focus on some of the key facets of the revolution including the role of artisan workers in Belfast, the Wexford and Ulster risings, the connection with the French Revolution and the ways in which the history of the rising has been manipulated. The introduction goes on to account for 1798 in terms of social and religious inequality within Ireland in the eighteenth century, and the influence of the American and French revolutions. It acknowledged that the extent to which the Defenders had moved beyond sectarianism is far from clear. It argued that the working class played a decisive role in the French Revolution and in Ireland, but was incapable of taking power for itself. It then discusses how people have sought to use 1798 for political purposes since the late nineteenth century. 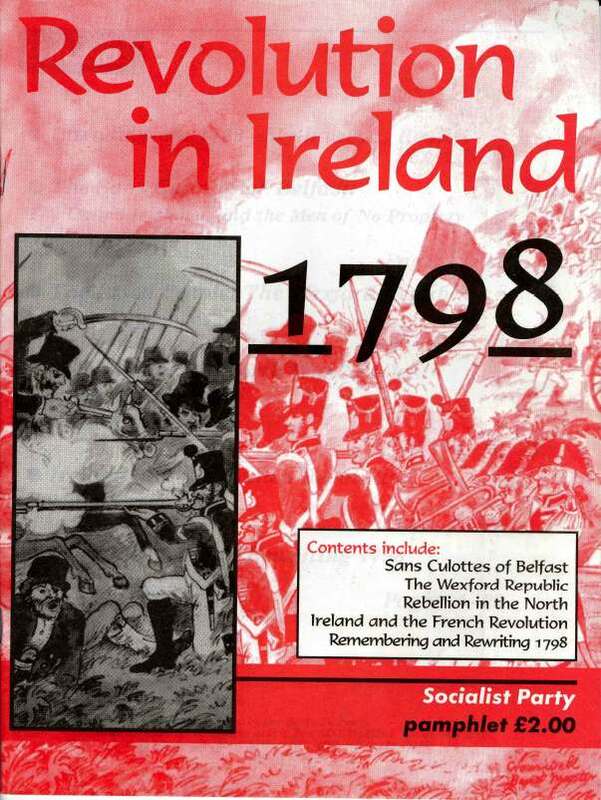 It rejected the idea that 1798 justified the position of Sinn Féin in 1998. Understanding what really happened in the past and dispelling Orange and Green myths is indeed vital. But it is only by combining historical understanding with a working class socialist programme, which among other things recognises that this island’s bitter history has now created two minorities – Catholics within the North and Protestants on an all-Ireland basis – that a progressive solution to the national question can be found. The extract focuses on strikes by cotton and linen weavers in Ulster in 1792, the high point of artisan working class militancy in the 1790s. It clearly illustrates the tensions between the pro-capitalist leadership of the United Irishmen and the interests of workers who were increasingly prominent in the revolutionary movement of the 1790s. The attempt to claim 1798 for one political or religious tradition should be ended in this bicentenary commemoration. The shared political project of the United Irishmen should be studied and discussed, now more than ever. The defeat of the 1798 rebellion marked a sad end to a century which had shown the potential to unite people of all religions in a republic in the true, original sense of the word. Anton McCabe looked at 1798 in the north, arguing that it cannot be reduced to Antrim and Down, and focusing on west Ulster. It was a more straightforwardly historical account than the others, but finished by noting the fate of William Henry Hamilton of Enniskillen after Emmet’s Rebellion of 1803. As a revolutionary, he personified all that was internationalist about the United Irishmen, and died fighting in the army of Simon Bolivar for the liberation of South America from the Spanish Empire. Tom Crean looked at Ireland and the French Revolution. Much of this article is taken up with a description of the French Revolution on the grounds that to understand Ireland’s relationship to the French Revolution, it is necessary to understand the French Revolution itself. Crean also stressed the internationalism of the United Irishmen. The United Irishmen were a consciously internationalist force inspired by the most profoundly revolutionary events the world had yet seen. Whatever their weaknesses, if there is one thing that socialists can draw inspiration from, it is this spirit of thoroughgoing internationalism. Eoin Magennis’s concluding chapter examined the way 1798 had been remembered and the way its history had been rewritten, from as early as 1799. He noted how the commemorations of the bicentenary were linked to the peace process. An interesting document then, and although – inevitably – research on this area has progressed subsequently it provides a good overview of thinking at the time. It is therefore useful for what it tells us about the SP’s view of Irish history and about the views of others on the United Irishmen. Posted by WorldbyStorm in Culture, Economy, European Politics, Irish Politics, Northern Ireland, Sinn Féin, The Left. · Bloody Sunday: Who was behind the scenes in Whitehall? · Passion and Politics exhibition at Hugh Lane Dublin City Gallery. Posted by WorldbyStorm in Culture, Economy, European Politics, Irish Politics, Northern Ireland, The Left. Many thanks to the person who sent this. The new issue of Look Left is available from the WP and the same outlets as the last one, and wider as we sort out distribution. It’s 32 pages now and will be staying at that size. As you’ll see it is very much a broad left effort with Stewart Reddin (ex-SF Dublin organiser), Joe Mooney, Dermot Looney, Conor McCabe and members of WSM writing for it. The contents also include the Saville Report, Fine Gael’s Fascist Roots, the “Great Mortgage Swindle” and an interview with Joe Higgins. A good wide range of materials and people. ABOUT 3,800 people who earned more than €100,000 last year paid no tax on their income, according to estimates prepared by the Revenue Commissioners. These individuals were able to avail of tax breaks in areas such as property investment and business expansion schemes, as well as tax relief on trading losses. A breakdown of the figures shows that most of those who had zero tax liability were company directors, while just over 600 were classified as PAYE workers. Granted these seem to date from 2007, and in fairness to one B. Lenihan he has a point when he notes ‘…many (some?) tax shelters have been closed off’. While some high earners may be able to escape paying high rates of tax, a breakdown of the overall level of income tax paid by workers in the State paints a different picture. Latest Revenue projections indicate that the top 2 per cent of earners accounted for almost one third (32 per cent) of tax collected during 2009. The top 5 per cent of earners accounted for almost half (48 per cent) of the total income tax take. The figures also show how many low-income workers are shielded from income tax. Almost half of all workers (46 per cent) earning below a certain threshold were estimated to be entirely exempt from traditional income tax, although some were liable for the income levy. Erm… there’s a reason those top 5% account for half of total income tax. That’s because they have proportionately much much greater wages. While those on the lowest incomes make feck all money in comparison. Still, got to love the way the poor put upon higher earners trope is gathering steam. The Beastie Boys… ah, the Beasties. Money Mark, or Mark Ramos-Nishita, has been associated with them working as keyboardist on Check Your Head and Ill Communication. He’s also been something of a producer at large and worked with a variety of other musicians. And that’s grand. But he’s also released a number of solo albums, three or four by now, and that’s even better. And his most effective album? Perhaps 1998’s Push the Button, a work that covers a myriad of genres, from the introductory mash up of samples on ‘Push the Button’ (a track that in other hands would potentially be very irritating), to songs like ‘Tomorrow will be like today’ which starts with a Velvet Underground strummed guitar then proceeds to merge Squeeze and Elvis Costello to good effect. It’s hugely melodic, driven by his keyboard, with a cracking chorus, and typical of the overall tenor of the album. Nor is it a one off. ‘Too Like You’ is equally good, as is ‘Maybe I’m Dead’ – underpinned by a big fat funky bass (keyboard?) riff, and the mordant, slightly jazzy, ‘Hand in Your Head’. It’s also surprisingly speedy in parts, 18 tracks, but some of them, as with the closing ‘Harmonics of Life’ is a brief 1 minute 54 seconds long, while no track exceeds 4 minutes or thereabouts. The poppy numbers are funky, jazzy, dancey, and even if Money Mark’s voice is sometimes (but only sometimes) a tad thin the music is sufficient to carry it. There’s considerable variety to the music, but almost all of it is worth listening to, nor is it overly sedate, not least on the entertaining ‘Power House’ with it’s invocations to ‘Turn it up! Turn it up!’ set to bleepy keyboard sounds that fade out like some warped soul half-brother to the intro to Hawkwinds ‘Silver Machine’. Yeah, maybe I wouldn’t want him as a neighbour – although the old Ted Nugent line ‘if it’s too loud you’re too old’ may apply. Everything flows nicely throughout, and overall there’s a summery feel to it that feels strangely appropriate as the current one draws to an end. Tomorrow will be like today – Velvet Underground goes Squeeze/Elvis Costello on us. .”My friend Dorothy and I spent a weekend at Heritage USA, the born-again Christian resort and amusement park created by tele-evangelists Jim and Tammy Bakker, who have been so much in the news. Dorothy and I came to scoff – but we went away converted. Waters is discussing yet again why his life and perspective is perfect, and all others are flawed. Of course he doesn’t quite put it that way. Except he sort of does. From 1997 How Labour has made the vital difference. oh and finally….Sugar Daddy is Back!